Before last Friday, I had gone almost four years since my last professional hair cut! Over those four years, I saved a lot of money by trimming my own hair (with a pair of professional-grade hair shears). But I was ready for a change, so, after getting some recommendations, I visited Erinn at Bouffant Daddy in Maplewood, with the intention of chin length or shorter. After talking with Erinn, we decided to start with a chin-length bob. I like it, but I’m still tempted to go shorter. In some ways, this is an awkward length — too short to really pull back, but long enough that it takes a decent while to air dry (I don’t get along too well with blow dryers). Shorter might play nicer with bike helmets and sun hats, too. It also doesn’t feel completely different, or “new,” since it’s similar to a cut I had at the end of high school / beginning of college (minus some excessive Sun-In highlights). On the one hand, I could live with this cut for awhile, and just go shorter in a few months. On the other hand, I have seven days from the date of the initial hair cut to change my mind and get a different cut for no charge. The clock on that is ticking. 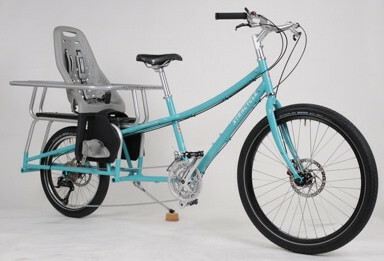 I am not finding any used Easyfit seats, so we’re planning to order directly from Xtracycle (apparently what I should have done in the first place!) . . . which means we have color options. We’ve narrowed it down to these four (orange, lime, blue, and silver), but it still feels like too many types of cereal to choose from at the grocery store. 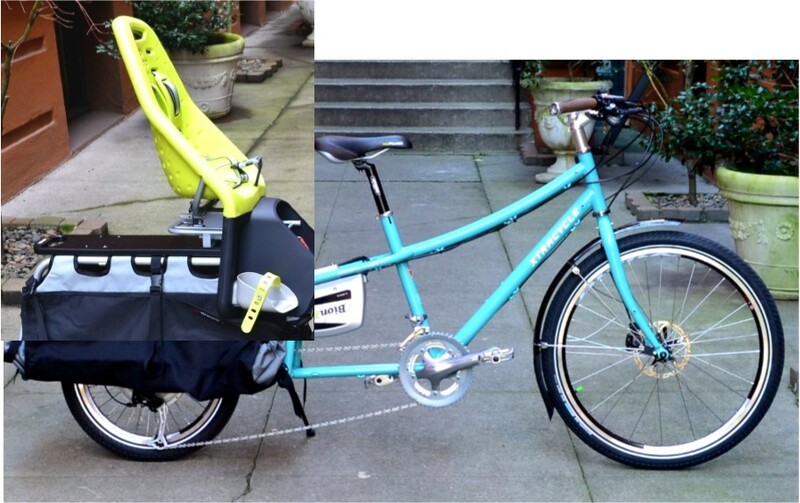 Matthew’s leaning toward the lime, which would look like this with our blue bike . . . The ‘silver’ seat (which mostly looks gray to me) was not on our original list, but I found this photo of the silver seat with the blue bike, and I like the look. Lime or orange seem like they would have some visibility advantages, though. Gah, decisions! At any rate, it will be nice to have the cargo capacity of the longtail. My decision to buy not one, but two furnace filters at the store today (they were on sale! 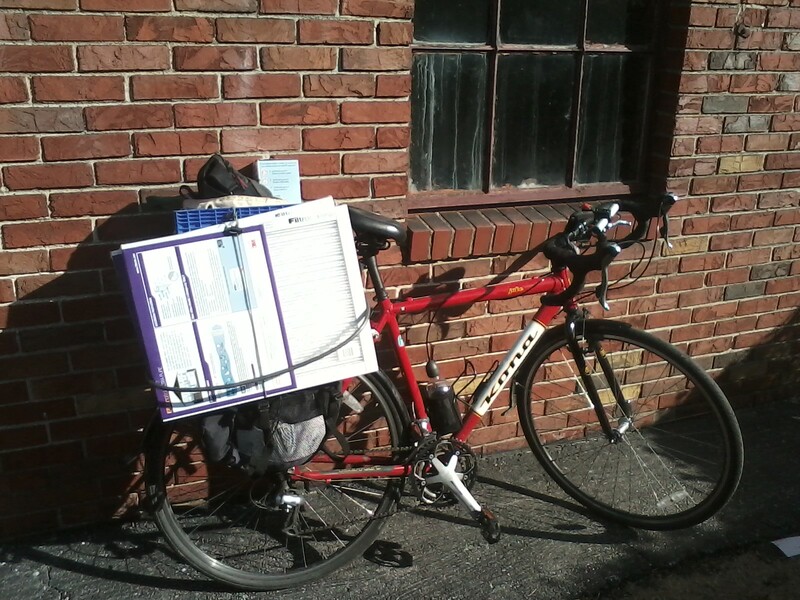 ), seemed great until I reached my bike and realized the diagonal of my milk crate is the perfect size for ONE filter. I managed to rig up something that worked well enough for the short ride home . . .
. . . but it was not the most secure set-up, so I stuck to smaller streets than I might have otherwise. I made it home with everything (two furnace filters, a fire extinguisher, and a half-gallon of milk) on board and intact, but it would have been much easier on a longtail! This entry was posted in Biking, My Life and tagged biking with kids, hair, longtail. Bookmark the permalink. First. Melissa, your hair color is gorgeous. Second, I think this length is quite flattering, but you could go another inch shorter and angle it slightly toward the front. That would lend a little bounce and swing, work well with helmets and hats, and probably feel a little different. 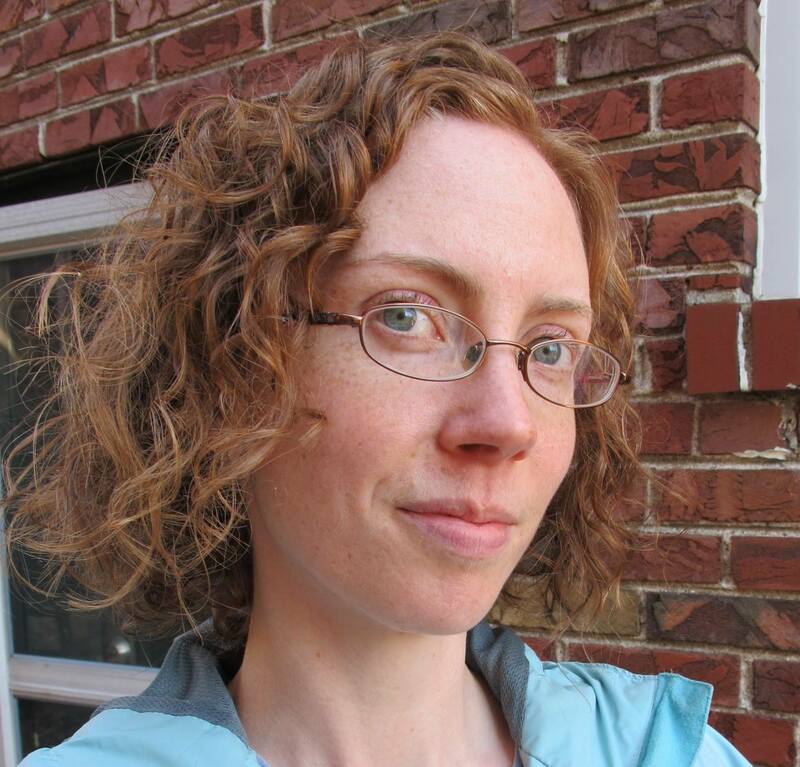 Third, your curls give my non-committal wavy strands major hair-envy! I vote lime kiddo seat. I love it with the light blue, and agree that it increases visibility! Thanks for your kind words about my hair. The color is one thing I’ve really never been tempted to mess with (well, other than the Sun-In). Excellent! I also use baking soda and vinegar on my hair, btw. (I followed the recommended links on your page.) Have since early 2012 and won’t go back to the commercial stuff. I have full support of my hairdresser!